Metals that "morph"�and make communities quieter? Yes: Boeing has successfully used "shape-memory alloys"�metals that change shape when heated and cooled�to lessen jet engine noise. They morph "chevrons" located at the trailing edge of jet engine housings, to give communities around airports more peace and quiet. The "memory" of "smart" alloys lets them change to a precise preset shape when heated above a "transition" temperature. Previously Boeing demonstrated that the chevrons reduce noise. Now, embedded with the alloys, they can change shape: When they become hot at takeoff, the 14-inch-long chevrons bend into the engine fan stream, altering how this high-speed air mixes with the surrounding air�and hushing engine noise by as much as half. In high-altitude conditions the chevrons cool down and retract, allowing efficient thrust for long-haul flight. They also can make planes lighter and more fuel-efficient, because less sound insulation is needed between engines and passengers. And they can help airlines meet ever tighter airport-noise requirements. Last August, Boeing engineers from a combined Commercial Airplanes Aeroacoustics and Phantom Works Flight Technology team successfully flight-tested these morphing chevrons on the Boeing 777-300ER Quiet Technology Demonstrator 2 (see the December 2005/January 2006 issue of Challenge). 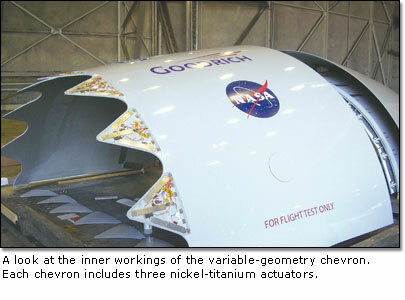 They wanted to be able to monitor the effects of the 14 chevrons in several different configurations on each test flight. To make this possible, they installed a control system with heater elements and shape and temperature sensors. With this system they could actively monitor and control individual chevrons to set a specific configuration of chevron shapes in flight�while measuring the noise both on the ground and inside the airplane. "The successful accomplishment of this task represents the first commercial use of a morphing structure to affect aircraft noise performance," said Bill Butler, the lead engineer for this group, which took the technology from concept to flight test in three years. Boeing engineers have been thinking of other uses for shape-change technology�new frontiers for both commercial and military aircraft. For example, the whole engine nozzle end might morph at different times during a flight to increase efficiency or reduce noise. Indeed, the changing shape of the future for the Boeing aircraft fleet, stakeholders and customers looks promising�and sounds quiet. Tad Calkins is a Seattle-based senior engineer developing smart materials and structures for the Aeroacoustic and Fluid Mechanics Group, Commercial Airplanes. The alloy NiTinol is a "transducer" material: It converts heat energy (in this case heat from the engine) into mechanical energy (a change in shape). The nickel and titanium atoms in NiTinol's crystal "lattice" structure can be rearranged repeatedly, easily and automatically, resulting in two phases, both solid. In the lower-temperature "martensite" phase the alloy is more flexible. In the higher-temperature "austenite" phase it is harder. Boeing engineers, led by technical lead Jim Mabe from Phantom Works Flight Technology, have developed processes that allow them to design the shape and properties of the austenite phase, including the transition temperature that triggers the change. They preset these properties by processing the alloys using the correct temperature and mechanical shaping. This ensures warmer air will transition the NiTinol and curve the chevrons.